On September 4, 2017 the Ministry of Industry and Trade of the Russian Federation issued a license to produce insulin finished dosage forms at Novo Nordisk OOO production facility in Grabtsevo industrial park, Kaluga Region. This is a major step in expansion of Novo Nordisk modern insulin production. The launch of FlexPen® pre-filled multi-dose disposable injection pens’ production is to become a new major stage of a project providing for additional investments in Novo Nordisk production facility located in Kaluga. A relevant was made at Saint Petersburg International Economic Forum in June 2017. FlexPen® assembly line has already need installed and currently undergoes a validation process. The official ceremony dedicated to its launch is to take place in mid-November 2017. Full cycle serial production of modern insulin, having the best quality in the Russian market, is to be commenced in the first half of 2018, and Novo Nordisk will get a status of a local manufacturer. Hans Duijf, Vice President, Novo Nordisk Russia/Belarus, said: “The fact that Novo Nordisk constantly increases the degree of localization at its modern insulin production facilities in Russia is a confirmation that Russia is an important strategic market for our company. The cooperation between Novo Nordisk and Russia began back in 1924, when Danish insulin was delivered to the Soviet Russia within two years of the medicine’s invention. Novo Nordisk has been closely cooperating with this country since then, and we strive to further strengthen our positions here to insure uninterrupted supply of high quality medicines to patients throughout Russia”. Novo Nordisk, being a co-founder of Kaluga Pharmaceutical Cluster, actively promotes the development of innovative production facilities in close cooperation with Kaluga Region Government. Its activities include the improvement of quality control; practices, personnel training and introduction of high HSE standards. Hans Duijf mentioned: “Novo Nordisk always sticks to efficient balance between financial, social and environmental aspects, following a concept we call a triune approach. We create long-term values meeting the needs of people, whose life depends on our medicines and services”. Hans Duijf also added: “We highly value the spirit of cooperation shaped in the course of our interaction with the Ministry of Industry and Trade and the State Institute for Medicines and GMP during a complicated process of inspections and licensing of the production facility for compliance with GMP requirements. Our joint efforts helped us come to mutual understanding and decisions which will bring benefits to Russian patients suffering from diabetes”. Currently Novo Nordisk Kaluga facility employs 260 people. Thirty seven new jobs will be created within the framework of the new project providing for production of FlexPen® injection pens. 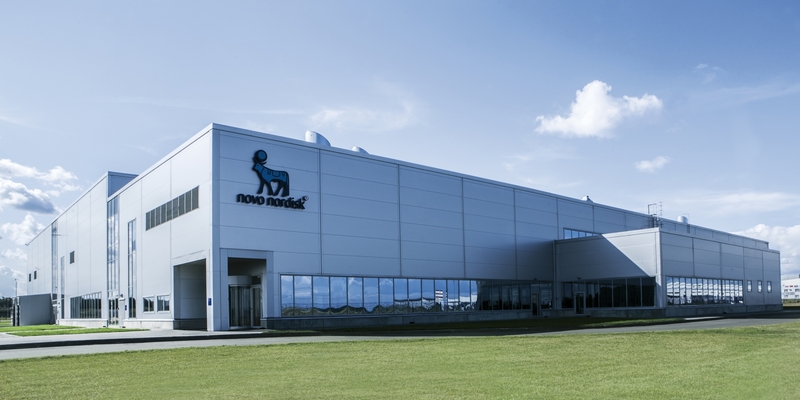 In 2015 Novo Nordisk OOO commissioned an innovative production facility in Grabtsevo industrial park, Kaluga, manufacturing the full range of modern insulins. It was a greenfield project. All pharmaceutical production stages meet GMP requirements. Innovative energy saving technologies have been used in the project. Over 260 new jobs were created. The total amount of investments exceeds RUR 8 billion. Based on Novo Nordisk data.